Newly planted trees: Immediately after planting, all tree roots are in the original root ball area. Until new roots grow into the soil of the planting site, water the original root ball area and just beyond this area. The root ball area may dry out faster than the surrounding soil, so check the moisture in this area frequently for the first month or two after planting. 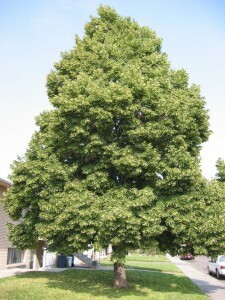 A newly planted tree may take 1-2 years to become established. Larger container stock trees may take longer to become established than smaller stock. Established trees: Don’t irrigate the area directly adjacent to the trunk – this can increase the risk of disease. Roots extend far beyond the edge of canopy or drip line. Water in the outer half of the area under the canopy and beyond the edge of the canopy. You can apply water effectively using sprinklers, drip irrigation, or a hose running on the soil surface. Regardless of how you apply the water, follow these basic rules. Water deeply rather than frequently. Because most tree roots are found in the upper 18 – 24 inches of the soil, this is the zone that should be wetted up in each irrigation cycle. Each deep irrigation will meet a tree’s water needs for between 10 days to 4 weeks during the hottest part of the summer, depending on the tree species and soil type. Source: This article was taken from the website of the Vacaville Tree Foundation. Although they are in California, the advice is spot on for Idaho. The only thing I changed was the list of varieties of trees and their water requirements.